Haflinger Snowbird. 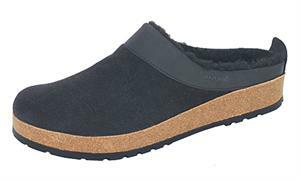 Unisex, shearling indoor and outdoor cork clog with arch support. Uppers made of oiled nubuck, innersoles made of shearling. Wool is not itchy, but provides warmth in the winter and wicks moisture in the summer. Wear with or without socks. Features cork outersoles which mold to your feet. A great clog or sandal should fit your heel snugly (but comfortably!). When the heel hits the ground, the pressure equals two-and-a-half times your body weight! Haflinger's contoured heel seat and extra padding help your body to softly absorb the impact of this heel strike. Pain in the back, neck and knees can be the result of shock that travels up the skeleton from a non-resilient heel. 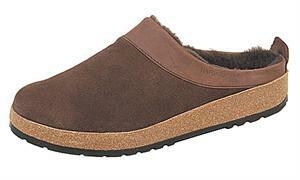 Haflinger Snowbird uses only the finest, 100% grown shearling in our clogs. The quality ensures that your Haflinger shearling clogs will retain their breathability and shape for the many seasons to come. As your heel impacts and stabilizes, our rocker heel encourages the foot to 'roll' forward so you can push off in the toes in a natural, balanced way. Haflinger's anatomically correct, cork-latex footbed is made of cork and latex (a natural rubber) mixture that gives you support but is soft enough to adapt to the unique shape of your foot. Our footbed provides support not just for your feet, but for your entire body - it will enhance your overall well-being by promoting good health in muscles and bones while easing the strain on the hips, knees and spine. With the proper foot support, the body experiences proper weight distribution, balance and utmost comfort - this encourages the feet and body to take the most natural walking and standing position. Comfort begins at the feet and works it's way up! 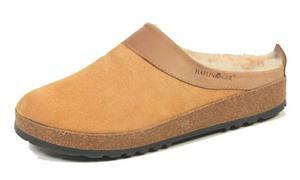 Haflinger shearling clogs offer more support than any other on the market! Because we use a wool felt lining (rather than a soft sheepskin liner), you never lose the benefit of the contoured footbed. And the soft and breathable wool-felt insole liner wicks away any moisture from your foot all year round. Our shearling clogs and sandals feature durable, year-round thermal rubber outsoles that will accommodate even the most active endeavors and lifestyles. These non-skid and weather-resistant soles will keep you stable and secure with every step. A roomy toe box with a toe bar follows the natural form of the foot and allows your toes to move freely and thus exercises and strengthens the foot's muscles and ligaments while promoting healthy circulation. Your toes will spread out freely, contract naturally and essentially 'work out' while you walk all day. Just like upper body exercise enlivens your body and mind, so does exercising your feet! Haflinger Snowbird is made in European sizes.